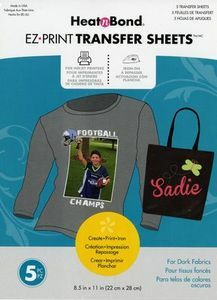 Decorating your own shirts and accessories is easy with these transfer sheets. Designed to easily personalize t-shirts, apparel, crafts and more with your favorite photos, logos, and images. Specially made for dark cotton and poly-blend fabrics. Designed for standard inkjet printers. Easy transfer with a household iron. Creates a thin, soft transfer, stretchable, machine washable and dryable. Minimal to no fading or cracking.